AN octogenarian grandmother will undertake a 24 hour charity cycle ride this weekend – in memory of her three lost children. 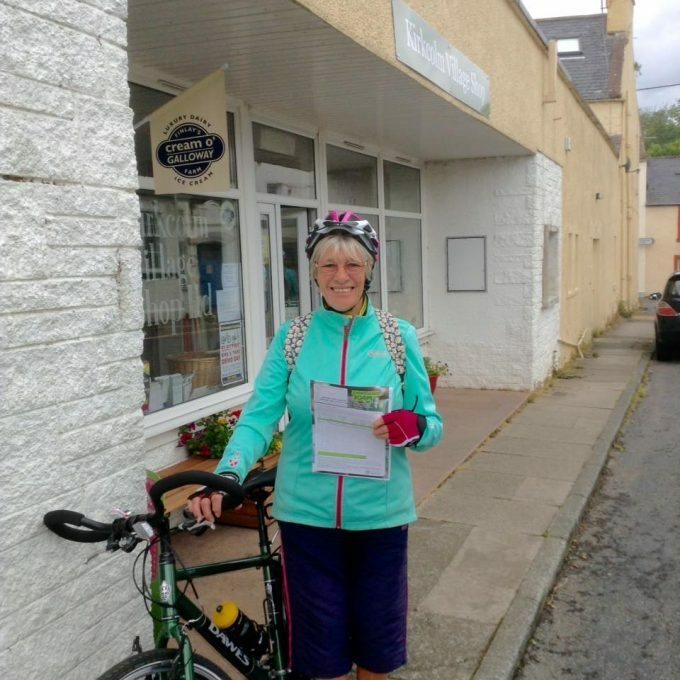 Mavis Paterson, 80, from Auchenmalg, will ride around Stranraer in circuits from noon on Saturday for Macmillan Cancer Support. And keeping her going on her epic fundraiser will be the thoughts of her two sons and daughter, all of whom tragically died in the space of four years. Bravely sharing her story, she said: “My husband John, died in 1996 and I still miss him, but since my three children died, I haven’t been able to concentrate on anything at all. It’s been unimaginable grief and its grief that never dies. It’s awful. “All my children were only in their 40s, that’s just way too young. Her son Sandy died first of a heart attack, the she lost Katie six months later to viral pneumonia. Mavis said: “After Sandy and Katie had gone, Bob and I decided ‘we’ve only got each other now so let’s do something together for Macmillan’. But after Bob was killed in an accident in 2016, she abandoned the plans, until recently. “It’s taken me a long time to get to this point and I’ve got a lot of help and support,” said Mavis, who is determined to give it her all. “Everyone is helping, the whole of the Macmillan committee will be out on the road at different points giving their support. I really do feel so grateful to them for helping me because this is therapeutic for me. She added: “We’re hoping lots of people will join us on our ten-mile cycle circuit and do it as many times as they want. I’m doing this for Macmillan but it’s also in memory of my three adult children, it’s for them. It’s not the first epic cycle ride she has undertaken – in 2008 she biked 6000 miles around Canada for Macmillan, following the deaths of her younger sister and her mum to cancer.